Continuing our theme of operating leverage and momentum, we examine Chemicals in the US and for some widely held non-US names to look for value where estimates are rising. Recent price target changes and estimate changes for Covestro (1COV) triggered our interest – here we appear to have a very cheap stock, unloved by a sell side that keeps raising estimates, and in two businesses with both growth and leverage. Other interesting long ideas thrown up by the analysis include: WLK, VSM and BASF. Companies at the other end of the table – with negative revisions, high valuations and an overconfident sell side are probably risky places to be unless you believe that the sell-side has it wrong and that earnings surprises are in the cards. Names that jump out are HUN, PPG, RPM and possibly POL. It is likely that both RPM and POL are popular and pricey because some sort of take-out discount is priced in. We think there is downside to HUN if the Clariant deal falls through. POL is just as likely to be a buyer as to be a seller – it would need to be a good deal to keep the POL momentum going if POL was the buyer. There are also some interesting pricing anomalies in our view, offering up some pairs trades, or at a minimum, overweights and underweights versus any index. Europeans really don’t like chemicals, but Covestro gets particularly harsh treatment despite very positive revisions – Lanxess is also cheap but without revisions support. Braskem remains the cheapest way to buy ethylene, and has strong revisions. May have more upside than WLK or LYB in a global ethylene up-cycle. 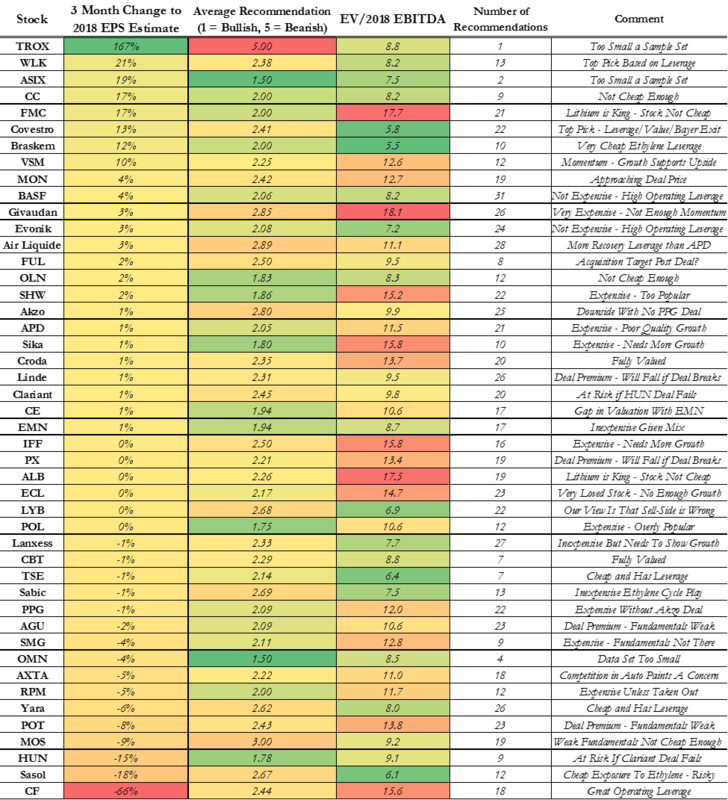 In the Industrial Gas space, both PX and LIN have high values relative to their past because both are pricing in deal synergies – both have downside if the deal does not happen. However, the Gas companies have high incremental operating leverage. Growth, particularly in the US, would likely drive significant positive surprises. APD has the highest sell side support and the lowest leverage to US growth. In Exhibit 1 we highlight the more interesting ideas – a complete table and some further comments are contained in the Addendum. 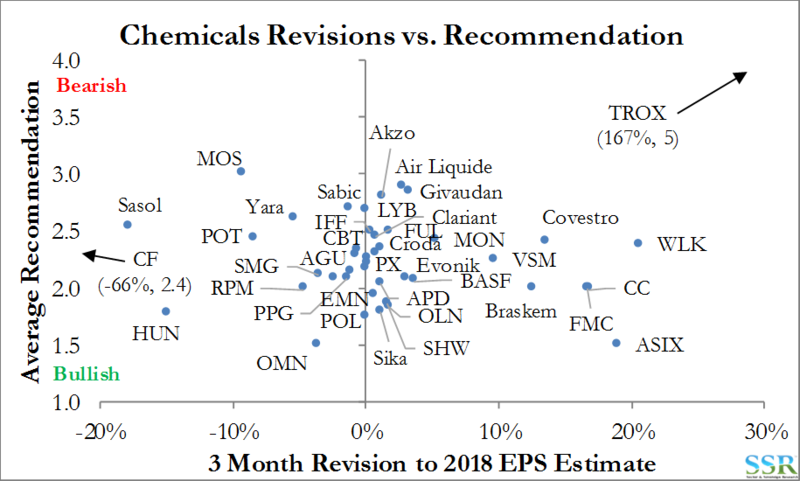 If we plot revisions against recommendations we get a mess – Exhibit 2 – with highly levered commodity names at the extremes – TROX needs to be discounted from the analysis because it has only one estimate and one recommendation. DWDP is missing because we do not have 3 months of revisions history. We will do this analysis again in December, when we will have the data. While not in this analysis, DWDP remains one of our favorite names in the space. The comments reflect our own views and clearly there are companies that we know better than others and stocks we have followed for longer. As discussed in prior research we have a bias against Ag where we think a weak farm economy will impact demand – this is the case for potash and is not the case for Urea. If we did not think that the deal was going through we would be very negative on MON.